so make sure you tune in for some lovely demos and a gander at all the gorgeous products and samples! 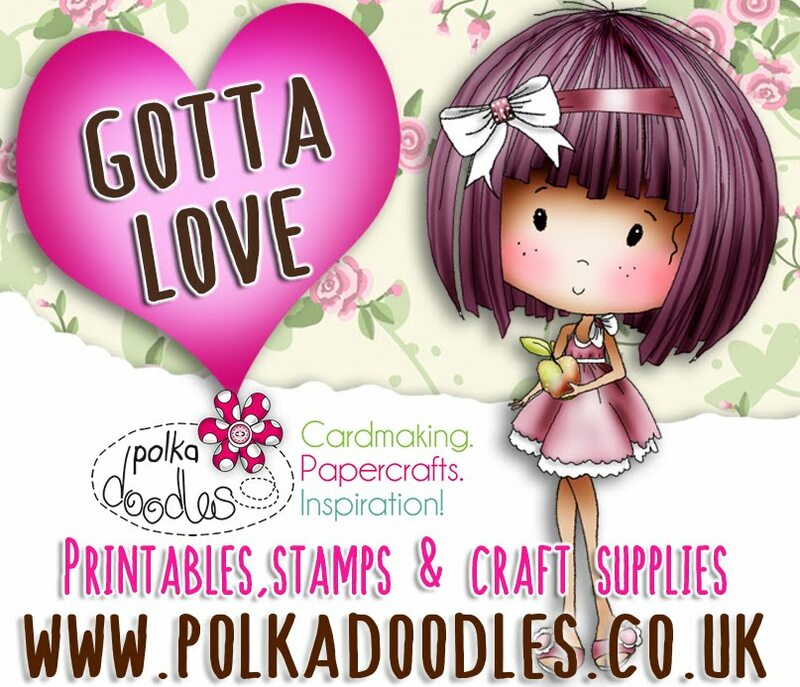 Secondly - make sure you also check the website this week as we have an absolute TON of new products to choose from including our latest collection, die cut sheets, stamps and...wait for it...digital cutting files! on digis in the store! But hurry the offer ends midnight on Monday 4th August! OK, let's get on with the challenge! 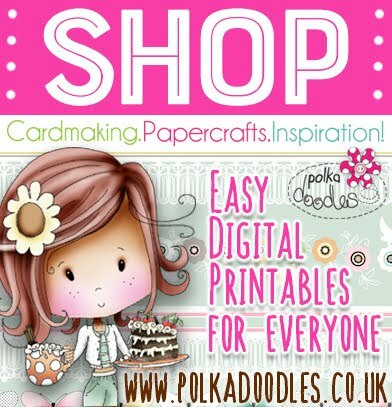 so obviously you can use this how you wish - layer papers up, layer shapes, embellies, flowers, die cuts - it's up to you but the more the merrier! You have until Tue 12th August to enter this one and the winner will receive a £5 voucher to spend in the Digistore, whoop whoop! Just please make sure you follow the challenge and the rules over there -> in the sidebar! Wendy - With the end of school for the summer, I've done this card to say 'Thanks' to the teacher. All the the backing papers and the image are from the Digistamp Bundle - Lou. and the image, which is perfect for a teacher, is coloured with Graph'Its. Anjie - On my card the image is from Emma Canning and is called Crimbo Shopping, but obviously you can use it all year round. She is coloured with Graph'It Markers. The papers, butterflies and flowers are from the Cherryblossom Lane CD. I have added 3 layers of paper which are all layered onto cardstock. 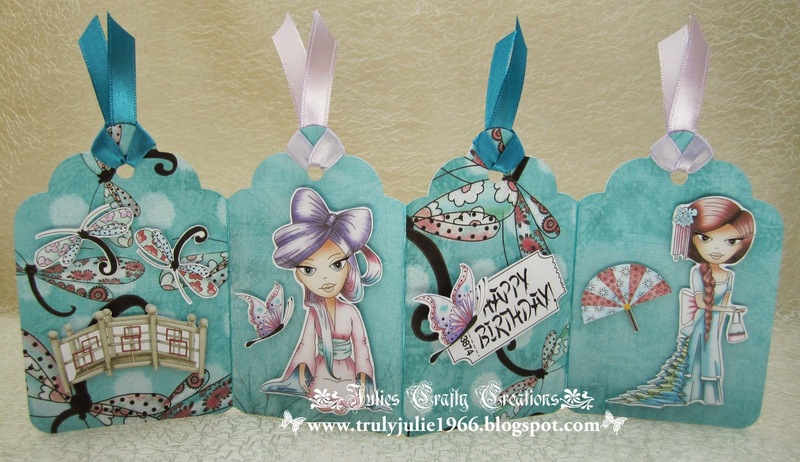 I have layers the bunting die cut, the butterflies and the flowers. Sharon - I have used Pretty Sweet Cd for my card this week. I have chosen 2 different papers, matted one onto pink Core'dinations for the base of the card then die cut the other along with some green Core'dinations and layered them onto the card. 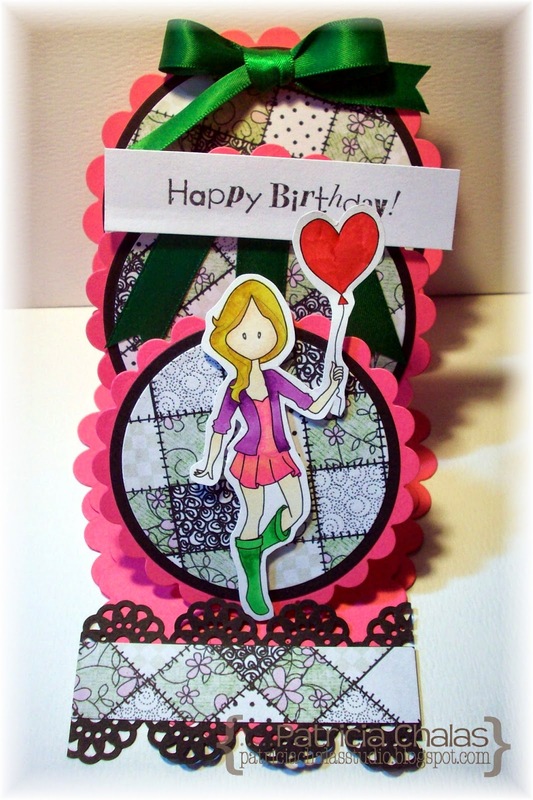 The image is Piper she has been pre-colored and again I have die cut her and inked around her in pink to match the card. The sentiment is from the same cd and has been matted onto a die cut. 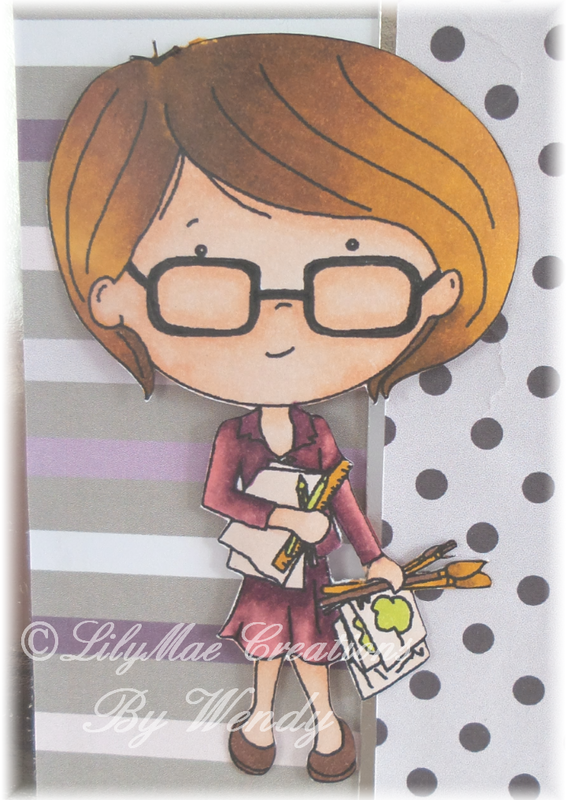 Yvonne - I used the image Cielle the Geek this week which is available as a digistamp and is also available from the 'Frederika Mini Collection Cd Rom'. The backing papers are from the 5th Anniversary Nikky Bundle. 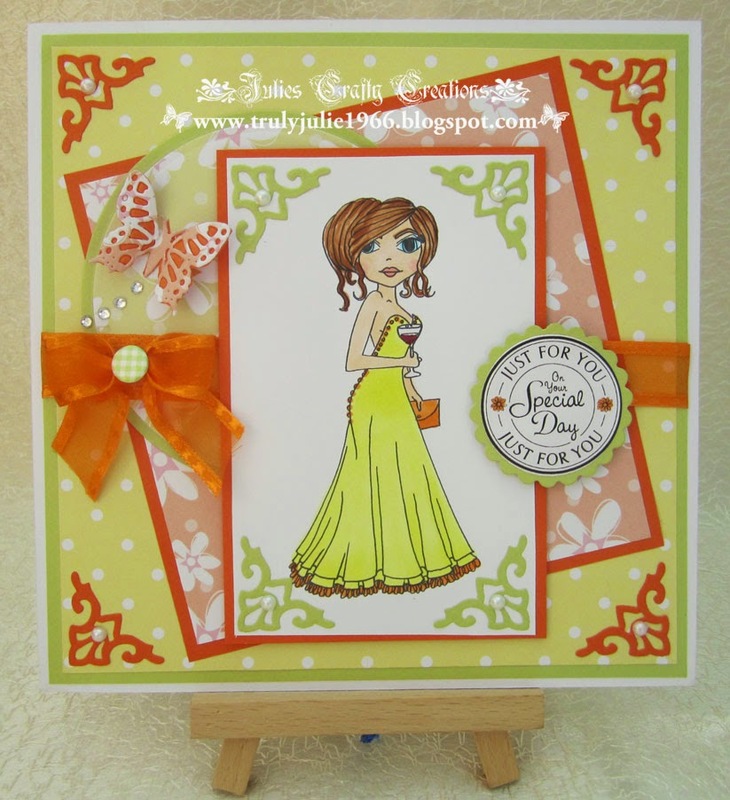 I also used the digistamp 'Bee Happy' which I think compliments the image and the papers quite well. 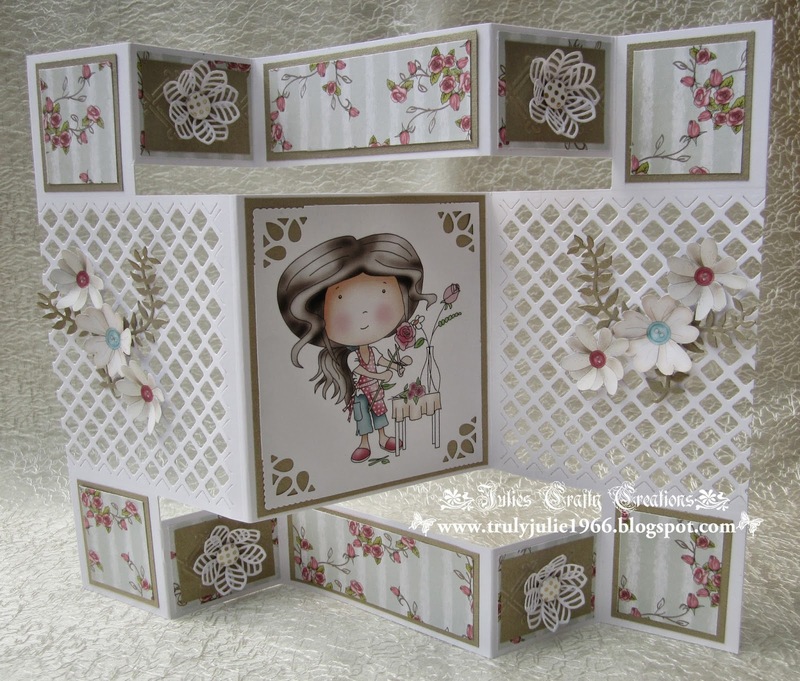 Some flowers, gems and die cuts complete the card. Patty - I used Papers from Here Comes Christmas collection and image from Pretty Sweet Cd from the Polkadoodles Digi World. I have chosen 2 different papers,and white bazzil for the base of the card then die cut with spellbinders the white scallop to stamp the sentiment from Stamp Doodles Set distress the edges and die cut the Instant photo in green to coordinate with the papers added the white MS border and to accent the card as a finished touch the 2 brown button with some white twine. Remember you have until 12th August to enter so just add your entry to Mr Linky below. Our Random winner chosen by Random.org is No 24 Carol Gill - well done Carol! 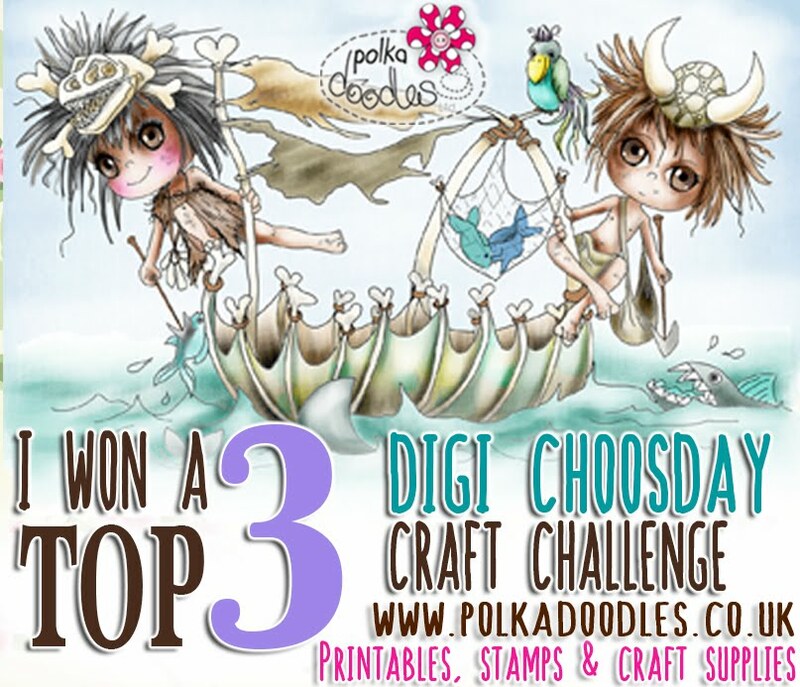 You've won 3 free digis from the store so please EMAIL US HERE quoting code DCw30001 to claim. Well done everyone! We loved all your entries it was truly hard to choose this week but thanks to everyone who entered! Do you remember us telling you a few weeks ago to keep an eye on the website for the release of some new stamps? Well they are here! More are being added all the time, so keep checking back so you don’t miss out. They flew off of the stall at Doncaster so we are busy getting more made up for you! We hope you managed to snaffle some of the amazing new stamp designs we launched - we had one whole range which virtually sold out - 8 stamps all sold out except for 3 stamps! Woah!! If you missed them the'll be back in stock soon and make sure you check the website for new stock which is arriving later this week! Have you seen our latest collection which we launched yesterday in the Work & Play Series? Yes, we have Number 6 for you and it's SOOOO cute!! You have until 5th August to enter and the winner will be announced on 12th August, so lots of time to get your entry in. All we ask is that you follow the theme and the simple rules that can be found in the side bar. You can find the winners from week 26 at the end of this post. This week 5 of the team have used the same download bundle, Christmas Joy, yet have all come up with something totally different from each other! It just shows you how versatile these collections are! So let’s see what the team have made for us for this weeks challenge! Crafting Vicky I'm soooo happy with this challenge with the opportunity to get a Christmas card done :) I used all fabulous papers and image from Christmas Joy Download collection it's so fabulous this set for all your Christmas makes!!! You really need to check it out! Wendy - Noooo, can't be christmas already! Ok well I should try to be a bit more organised, so this is my first christmas card make this year! 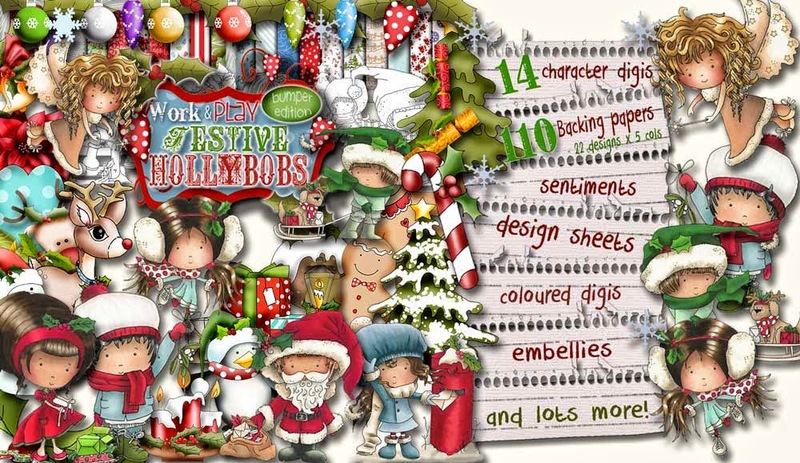 I've done a box card for this and all the elements are from the Christmas Joy download bundle. Anjie - On my card the papers, trees and sentiment are from the Christmas Joy Download Bundle, and the image is Decorating The Tree Digital Stamp by the lovely Emma Canning. She is coloured with my Graph'it Makers. I decided to do the tree different by colouring it in pink. 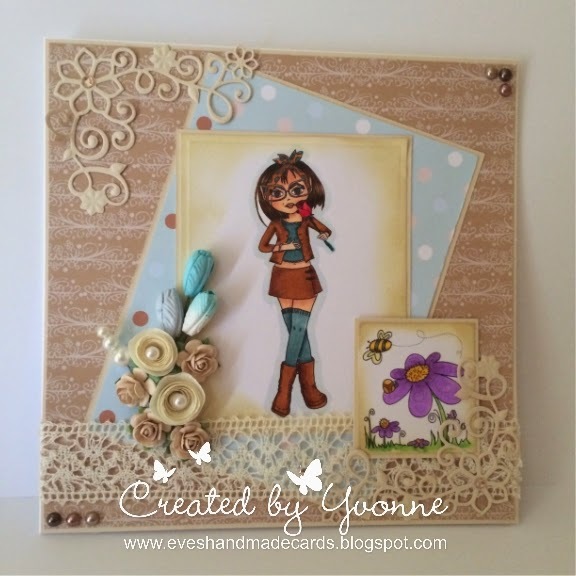 Yvonne - I decided to make a twisted easel card, I haven't done one of these before so it was a bit new for me. I used Emma Canning's 'Mistletoe Kisses' which you can find on 'Digi Download' collection along with the tree that I have used also. I coloured both elements with my Graph'It Markers. I used the fab new papers from the 'Festive Hollibobs Work & Play Collection', the bell embellishment is from the same collection, as is the sentiment. I used some Tattered Lace snowflake dies and some flowers, gems and ribbon from my stash. Sharon - Merry Christmas in July everyone! 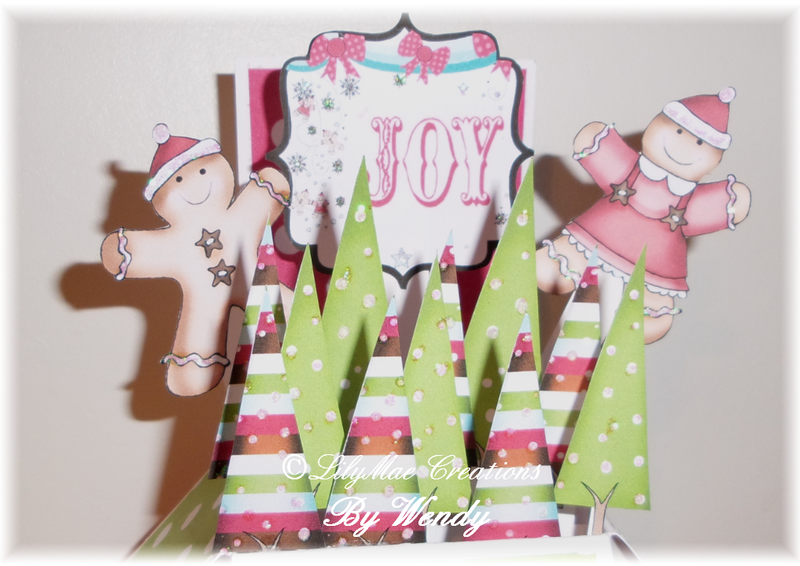 I have used the Christmas Joy bundle from the Polkadoodles Digi World for my card. I have used my silhouette to cut card base using a bauble silhouette file, by welding 3 together it has given me a concertina card. I then used the dotty paper from the bundle over some green card as my mats. 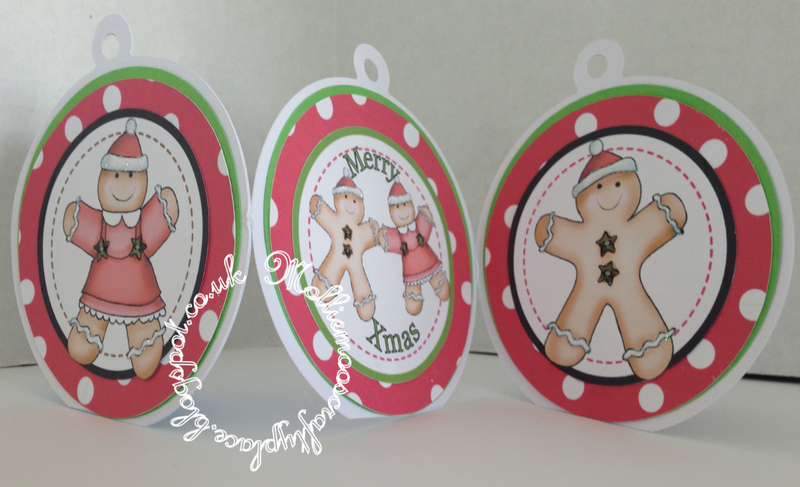 I resized the gingerbread people using a graphics program and added Merry Christmas to the middle one these were then matted on top of the dotty paper. When the card is closed I have tied it with green ribbon threaded through the bauble loop! Patty - It's almost Christmas!! 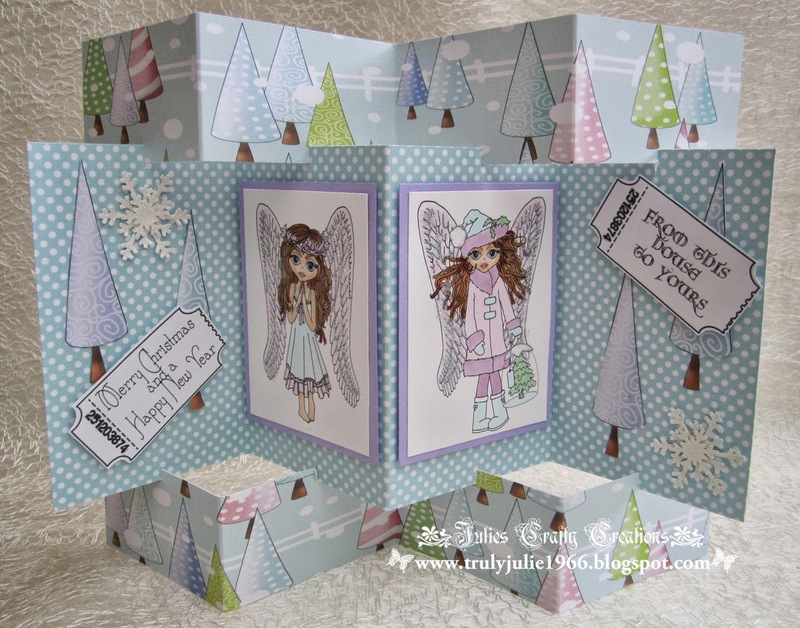 I made this love and cute Christmas Card, using images and Paper from Here Comes Christmas from the Polkadoodles Digi World for my card. The image is Choir and I distress the edges with brown ink, for my base I used lime pearl green, use the MS border punch to make the bottom white border as a finished touch the green bow on top. The Sentiment Celebreate the Season is from a old clear stamp set I have. please email us at HERE quoting DCwk29001wk26 to claim your prize of a 3 free digis. We hope you have all had a fabulous weekend. We were at the Summer Crafting event at Doncaster and had a great weekend. 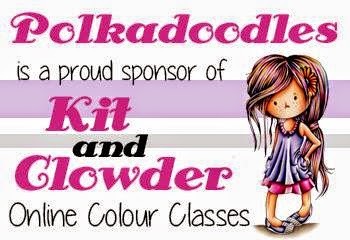 It was such a pleasure to meet so many of you lovely crafters, thank you to those that came along and said hi to us, it is great to be able to put faces to names! 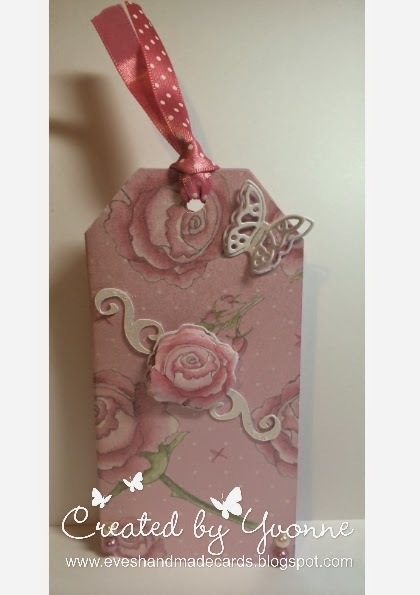 You can make anything you like, a card, a tag, a box, mixed media projects, whatever takes your fancy, as long as it has a tag as the main focus. You don't need to use any of our products to enter, we just ask you to follow the rules in our sidebar. You have until 29th July to enter and the winner will be announced on 2nd August, so lots of time to get your entry in. Crafting Vicky - For my tag this time I used a the fun set Girls Hoot Download bundle. I changed the colors using my word document. I also used some papers from Classic hearts papers. It was sooo fun to make and I'm sure that my dad will love it! Wendy - This week I have Gone East, well Dollie has! 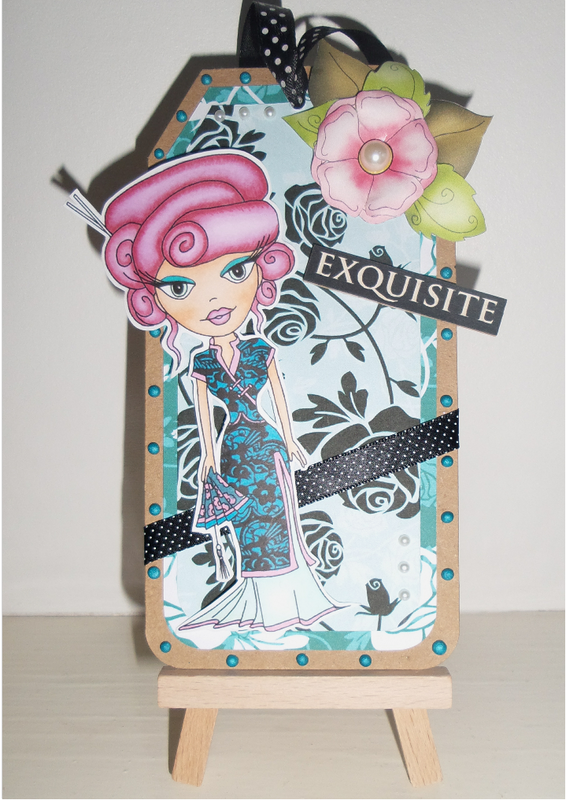 I've used Dollie Daydream Oriental Digi and coloured in non traditional colours.The background papers are from the Rose Papers Bundle and altered to a teal colour in Craft Artist. The flower accent is from the Pretty Little Things bundle. 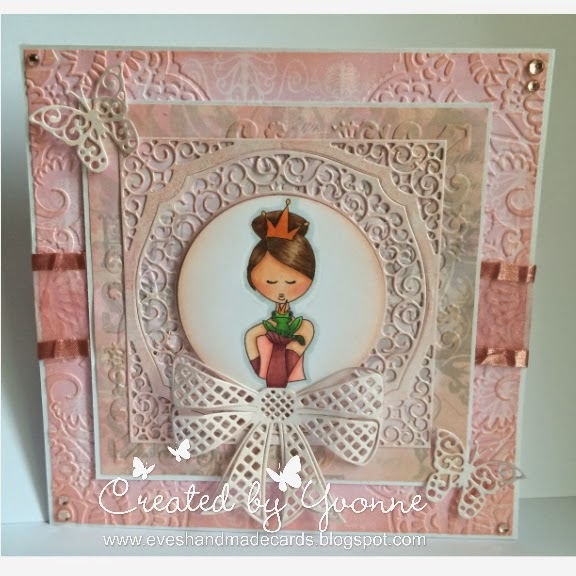 Sharon - Despite this week being tag it I have still made a card and tagged it! 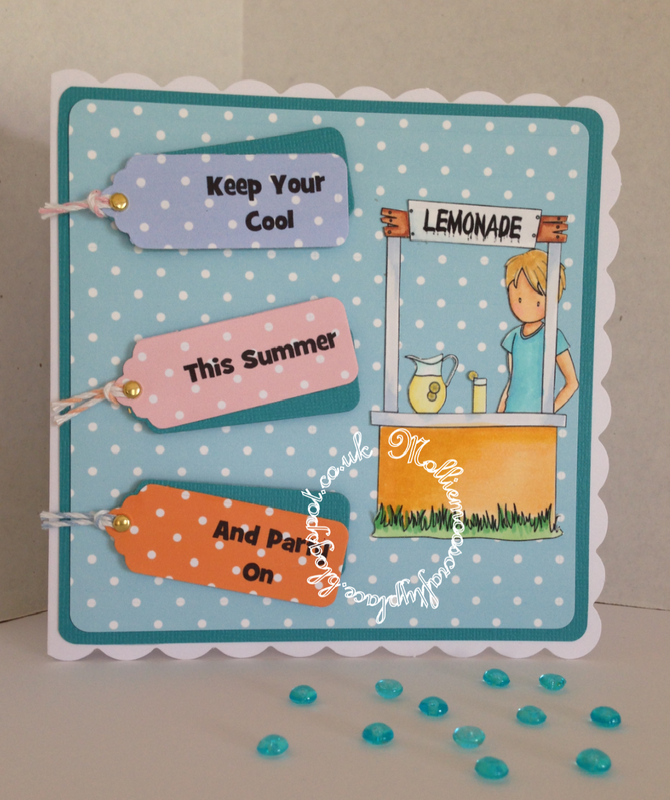 I have used Emma Canning's Lemonade digi stamp colored with my Spectrum Noir pens. I then fussy cut him before adding him to my card matted and layered with Core'dinations card and Emma's polkadot digi paper in a lovely aqua color. I printed my sentiment onto 3 more colors of the papers from the same collections and die cut using a tag die. Core'dinations card again to mat these, bakers twine and a brad finishes them off before they were placed on the card. 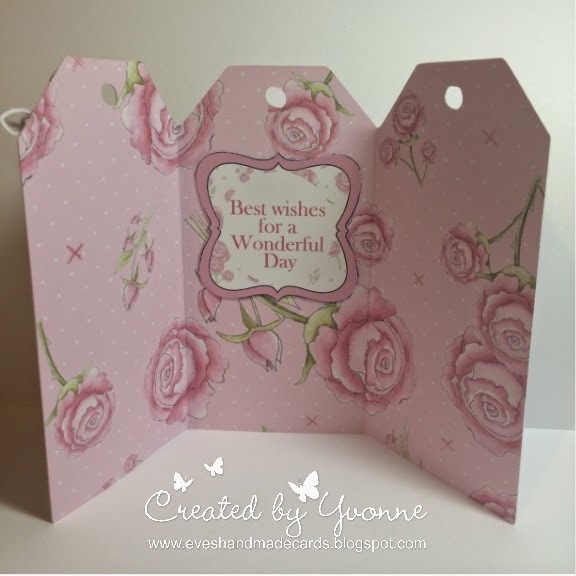 Yvonne - For this weeks challenge I used the Roses Download Bundle, the papers in this bundle are just beautiful! I printed one of the rose papers onto centura pearlescent card and then, I printed it again on the back, making my own double sided paper. I used my Cricut to cut a tag 'card'. i printed out a few of the rose embellishments to add some to the front of the card and accompanied it with some flourishes cut on the Cricut. 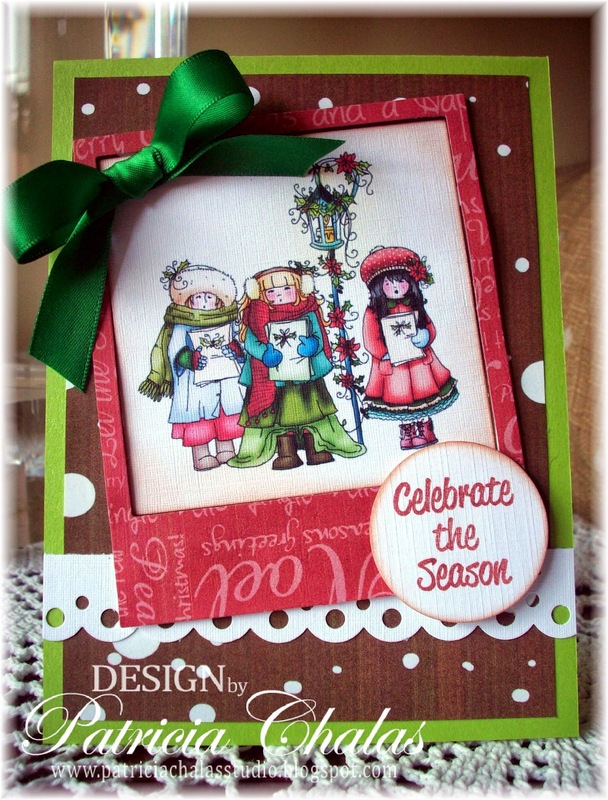 I used the Celebrational Sentiment Bundle for the sentiment inside my tag card. I added a little butterfly, some gems and dotty ribbon to finish. Patty - this week challenge was a real challenge for me... I didn't know what to type of tag to make after I lot of thought I made some cheerfull tags. I used papers from the Sugar Birdies Collector Edition CD the papers on this bundle are just beautiful! Used the mini flowers and the plain blue to make the base and layer of my tag, use some organza green ribbon for the loop on top, added the browish button with some black and white twine, stamped cheerful sentiments with black memento ink from Stamp Doodles set onto green cardstock and layered on top of all the layers. What great makes we have this week!! The winner chosen at random was #12 Lucinda Lucker - well done! please email us HERE quoting DCWK28001WK25 to claim your prize of 3 free digis. Grab your badges from the side bar. Congratulations everyone, thanks for all your entries and we hope you enjoy your freebies! See you next week!! You can make anything you want, it doesn’t have to be a card, as long as you use some punches or die cuts, or both! You have until 22nd July to enter and the winner will be announced on 29th July, so lots of time to get your entry in. All we ask is that you follow the simple rules that can be found in the side bar. 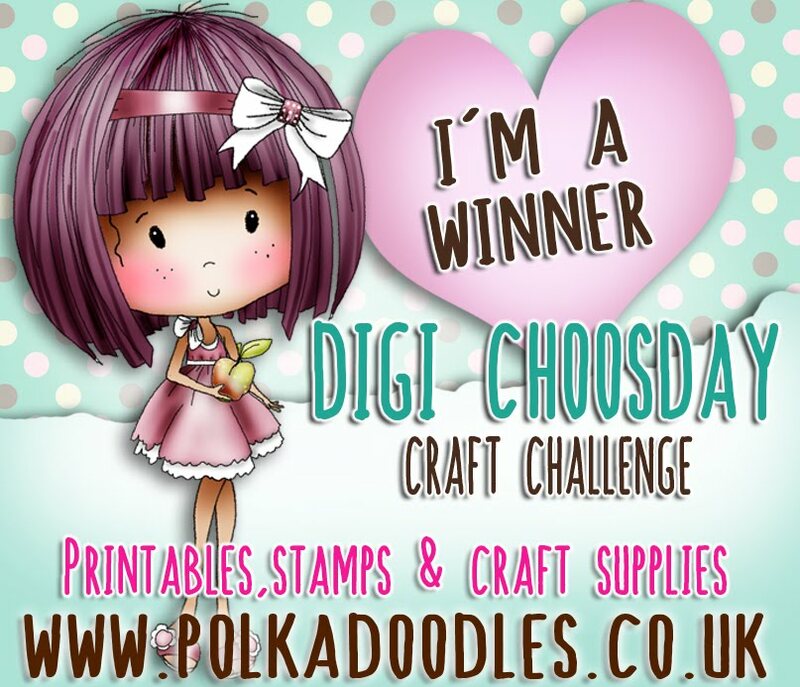 The winner will receive 3 free digi images from the Digi Store. Remember - you also still have time to enter last week's aperture challenge which is HERE so if you missed it check it out. please email us at here quoting DCwk27001wk24 to claim your prize of a 3 free digis. Well done everyone go grab your badges from the side bar - thankyou so much to everyone who entered, we really appreciate you taking the time to play along with us every week! Now onto what the team have made for us for this week! Anjie - Here is my DT make for this week. 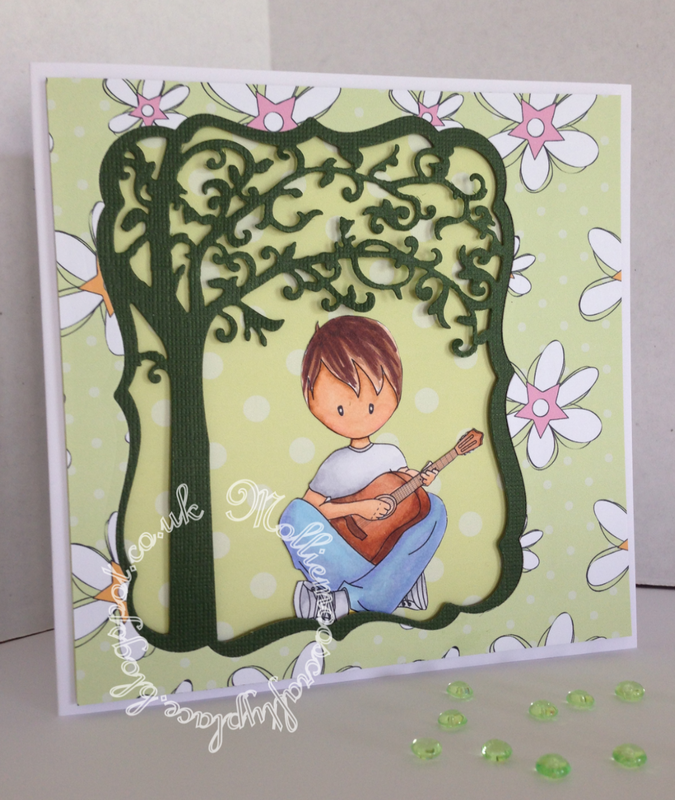 The image, papers, sentiment and embellishments are from the stunningly beautiful Rose Budd CD. I have coloured the character with my Graph'It Markers. As you can see I have used die cuts. The tree, the small corners and the large corner are all from Tattered Lace, and I think they all work well with each other and with this CD. Crafting Vicky Well now I'm in total Heaven! Dies and punches! I really love dies and punches! So for this card I loved using both. 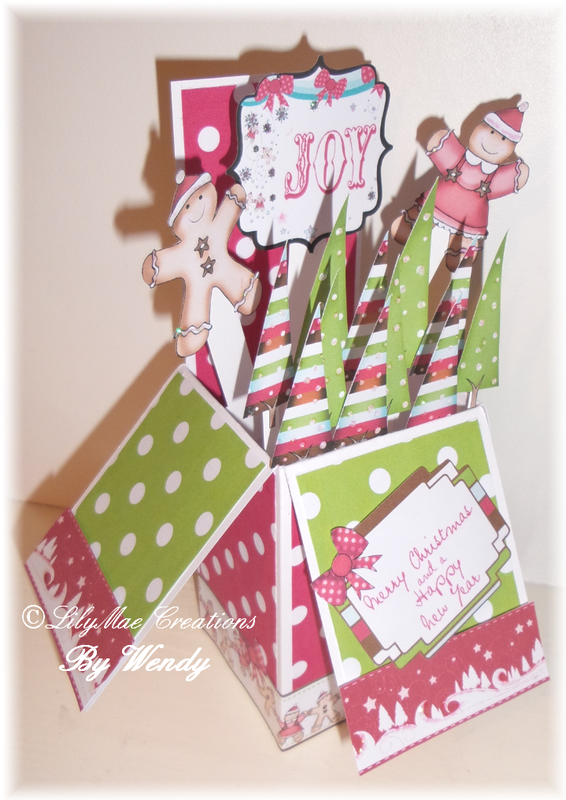 I have crafted with the great Emma 3 scoops and some papers and embellishments from Candy doodles collection edition. Such a fun CD!!! 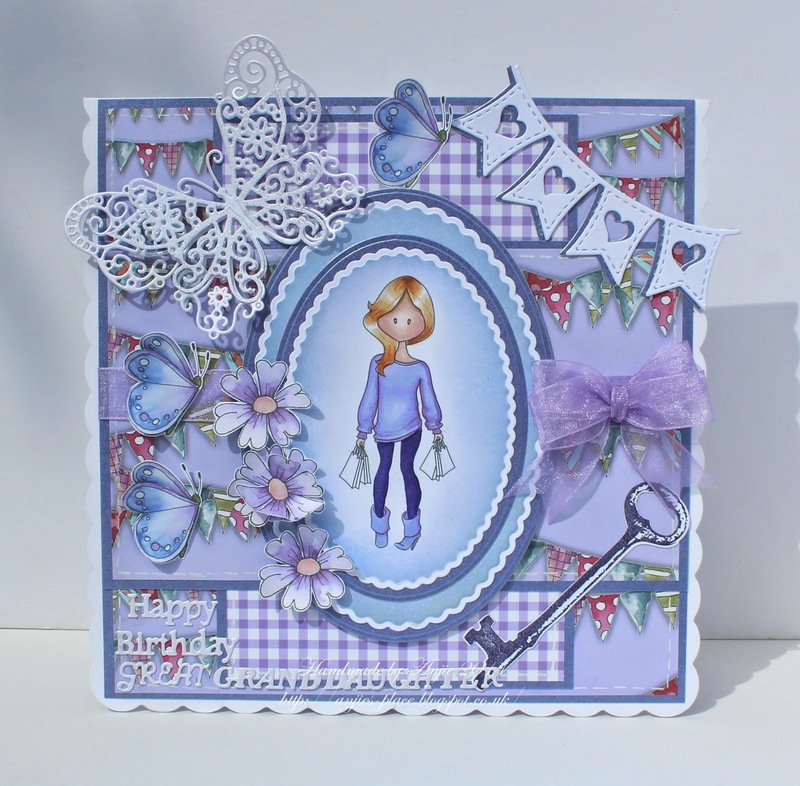 Wendy - Totally loved making this weeks card, got to play with some of my favourite dies! I've used Summer Stroll from Emma Canning and coloured with Graph'It markers. Both backing papers are from Picknix 1 CD and the sentiment is from Work & Play 2 digi collection download. Yvonne - Hello everyone! This weeks challenge has got to be one of the BEST ones ever! Use your dies and/or punches, so many people think that using digi stamps and digi papers your project is going to be flat. Well they couldn't be more wrong, digi stamps are just as adaptable as the rest of your craft stash. I used Emma Cannings Digi Stamp Kiss the Frog and I coloured her and her handsome Prince with my brilliant Graph'It Markers, I have the markers used, listed on my blog. I used two backing papers off of the new Rose Budd CD-Rom Collection, I embossed the larger backing paper with the new Tattered Lace Embossing Folder - 'Tattered Lace'. I then edged all the papers with Distress Ink 'Tattered Rose' and then I cut the image out with Tattered Lace Die 'Westminster' collection. I inked them with Tattered Rose also. As you can see, the dies used just compliment the image so well - I hope you like it as much as I do!! Sharon - I've decided my pens needed a rest this week, I have only used them to color the centres of the flowers on my sentiment and used papers and a sentiment Polka Doodles Sugar Plum Daisy CD. I have made the card by folding the Dotty lilac paper in half then die cutting it with a spellbinder die leaving one edge free of the die so I had a card blank. One side of this was folded to make the easel part. I then used same die on the flowery paper to make the top of the card. I used a X-cut punch along 2 strips of the darker spotty paper and folded this to make a rosette which holds my sentiment. A butterfly from the same cd is just hovering over the rosette. The button was made using an epiphany punch and more of the darker shade of dotty paper. This was placed on a ribbon bow and used as the stopper for the card. What stunning makes from the ladies this week, I'm sure you'll all agree! Gorgeous! at the checkout! Whoop Whoop! THis offer only lasts until 7th July so don't miss an opportunity to save a third on all your digis! Have you seen our latest release? Yes, Crimbo has started already - in fact we're quite late with our Christmas release but we think the wait is worthwhile because this is sooooo cute! You can make anything you like, a card, a tag, a box, mixed media projects, whatever takes your fancy. As long as it has an aperture as the main focus. You don't need to use any of our products to enter, we just ask you to follow the rules in our sidebar. You have until 15th July to enter and the winner will be announced on 22nd July, so lots of time to get your entry in. Anjie - The beautiful image is by Emma Canning and is called Summer Stroll. She is coloured with my Graph'It Markers. I made the aperture card myself using some Spellbinders dies. The papers are from the Bonbon Belles Double CD as is the bunting. The butterfly is from one of the Tattered Lace mags and the ribbon and flowers are from my stash. I have used some of the same paper to mat behind the image on the inside of the card to frame it. Crafting Vicky - Ok so what is it with me starting with the team?!? 2 challenges already that are usually not my style... actually never made an aperture card lol. But it was fun once I overcame my fright :) So I used the fabulous Birthday wishes download bundle. 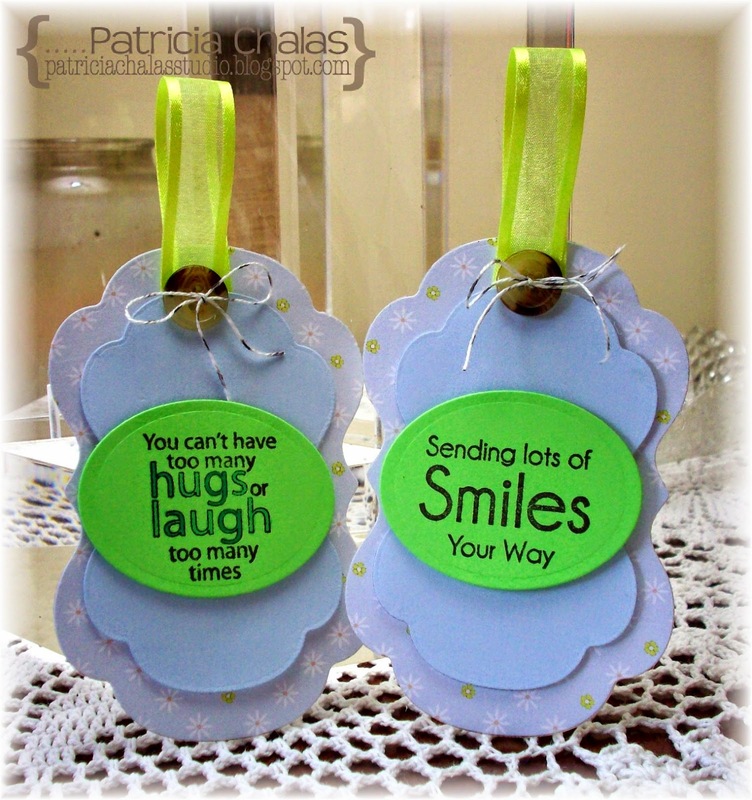 The sentiment comes from the set Celebrational Sentiments Download bundle. 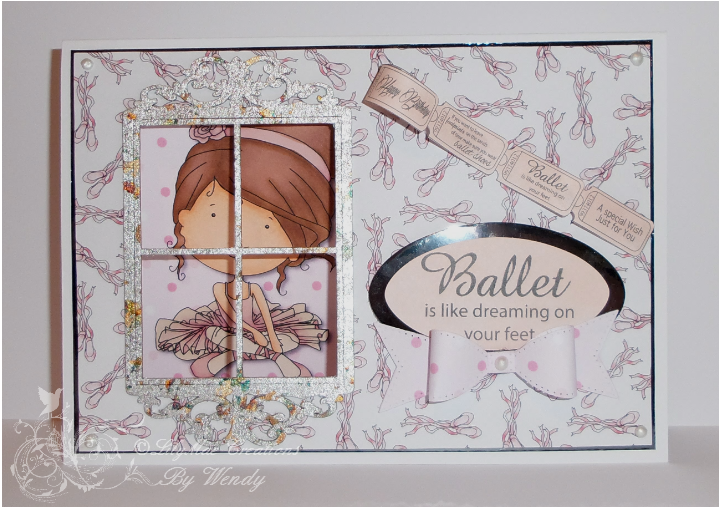 Wendy - So excited when I saw this theme, I knew straight away the image I wanted to use. The ballerina and all the papers are from Work & Play 2, as is the ticker tape which comes as individual sentiment tickets, but I've adapted it into a strip using Craft Artist and coloured with Pan Pastels. Sharon - Welcome to the aperture week! My card is a little hippie sitting under a tree. I colored Emma Canning's Guitar boy image with my alcohol markers and used Emma's Green brown and white paper downloads. 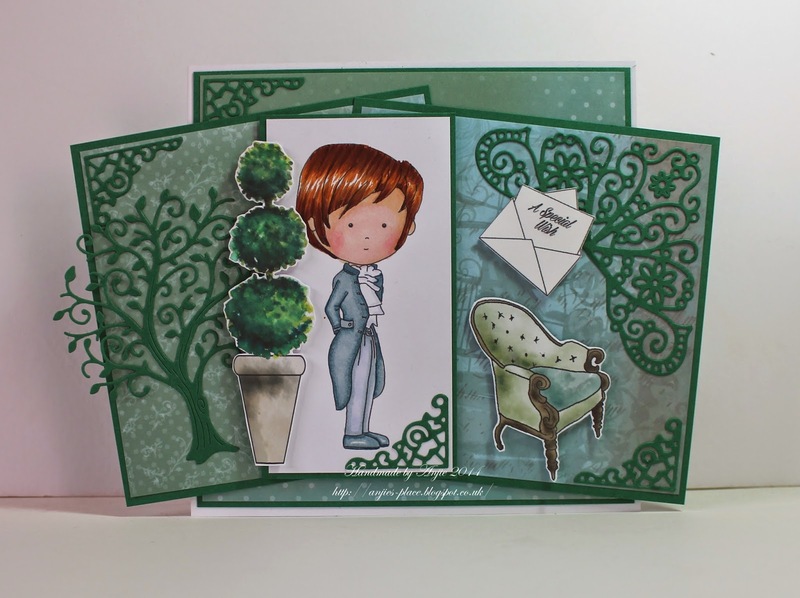 The tree is cut using a spellbinder die and matted under the top paper. Yvonne - Hi everyone! For this weeks challenge I used a 7x7 card and cut out the centre with a square spellbinder to give me an aperture window. 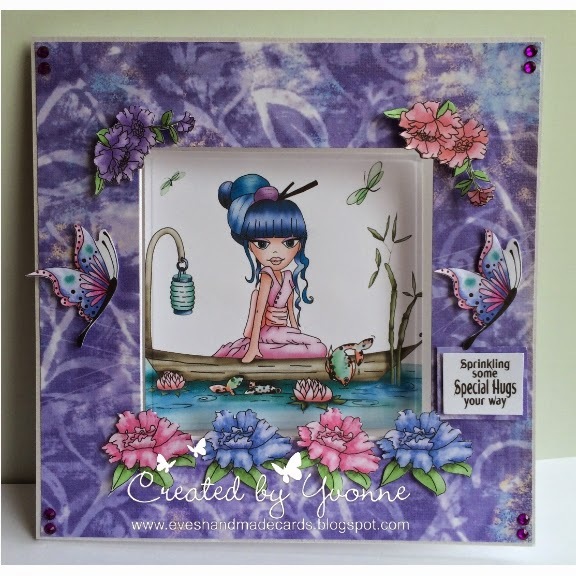 I printed off the Boat Digi Stamp from Dollie Goes East Collection which you can get as a CD-Rom and digi download or you can just download the image from either the digi store. The paper is from the same collection as are the flowers, butterfly's and the sentiment. Wow, what great makes we have this week, as always!! please email us HERE quoting DCW21001 to claim your prize of 3 free digis. Grab your badges from the side bar. Congratulations everyone, thanks for all your entries and we hope you enjoy your freebies! See you next week!